New Directions Publishing Corporation, 9780811224116, 112pp. Marcel Proust's genius for illuminating pain is on spectacular display in this recently discovered trove of his correspondence, Letters to His Neighbor. Already suffering from noise within his cork-lined walls, his poor soul was not ready for the fresh hell when his neighbor Dr. Williams married a widow with small children. Chiefly to Mrs. Williams, these ever-polite letters (often accompanied by flowers, compliments, books, even pheasants) are frequently hilarious--Proust couches his fury in a gracious tone. In Lydia Davis's hands, the digressive brilliance of his sentences shines: "Don't speak of annoying neighbors, but of neighbors so charming (an association of words contradictory in principle since Montesquiou claims that most horrible of all are 1) neighbors 2) the smell of post offices) that they leave the constant tantalizing regret that one cannot take advantage of their neighborliness." Proust makes fine distinctions among his auditory torments: "The valet de chambre makes noise and that doesn't matter. But later he knocks with little tiny raps. And that is worse." Lydia Davis has written a generous translator's note, tracing much of what we can know about Proust's perpetually dark room; she details the furnishings as well as the life he lived there: burning his powders, talking with friends, hiring musicians, and, most of all, suffering. 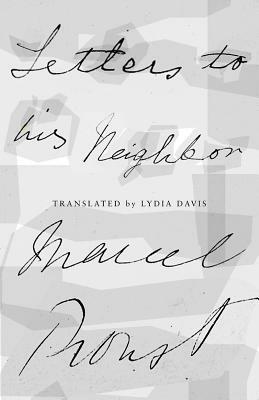 Letters to His Neighboris richly illustrated with facsimile letters and photographs--catnip for lovers of Proust. With an Introduction by Jean-Yves Tadi and a translator's note by Lydia Davis.